For other uses, see Crime and Punishment (disambiguation). Crime and Punishment is a two-part British television crime drama series, based upon the novel of the same name by Fyodor Dostoyevsky, that first broadcast on BBC2 on 12 February 2002. The novel was adapted for television by playwright Tony Marchant, and was directed by Julian Jarrold. 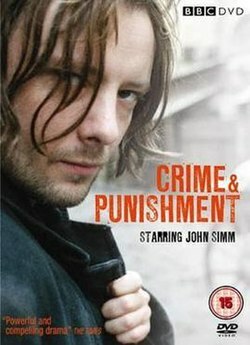 John Simm stars as Rodya Raskolnikov, a former student who plans the murder of a pawnbroker to alleviate his financial problems, but also as an existential exercise, feeling himself able to commit such acts without guilt, remorse or justification. The series was broadcast over two consecutive nights, airing in the 9:00-10:30pm slot. The series was released on DVD on 25 August 2008, via 2|Entertain. The series was filmed in St. Petersburg. Simm said of his role as Raskolnikov; "The hard job for me is to make the viewer understand why Raskolnikov kills. But that is helped by seeing the place that he has to live in, it was absolutely disgusting. He is a very intelligent guy, who is slowly driven to madness by the things he sees around him." The series gathered mixed reviews in the press, with The Guardian claiming that "As Raskolnikov, the murderer, John Simm is the spindle the whole thing whirls around. He gives a vivid performance and looks like a vicious angel. In the current Augean state of the stables, I am not able to find fault with this well-bred winner"; while The Telegraph were more scathing, writing "It's as if scriptwriter Tony Marchant and director Julian Jarrold had decided to take the setting and crime-drama structure of Crime and Punishment and ditch the philosophical core, the engine that gives everything meaning." Raskolnikov is a penniless young man incensed at the injustice he sees around him. Believing no one will miss her, he decides to rob and kill an old woman. But his own guilty conscience and the psychological skills of the murder investigator prove to be his undoing. Still haunted by his crime, Raskolnikov is visited in St Petersburg by his mother and sister Dunya, both of whom are alarmed by his worsening condition. Meanwhile, a dogged Porfiry remains on Raskolnikov's trail, convinced of his guilt but lacking conclusive evidence. ^ "Crime and Punishment (TV Miniseries) (2002)". ^ "Crime and Punishment [Part One] | BFI | BFI". Explore.bfi.org.uk. Retrieved 26 May 2014. ^ "Crime and Punishment". 12 February 2002 – via www.imdb.com. ^ "Crime and Punishment". 25 August 2008 – via Amazon. ^ "BBC - Drama - Crime and Punishment". www.bbc.co.uk. ^ Deans, Jason (13 February 2002). "Crime and Punishment". the Guardian. ^ "Crime and Punishment - BBC Two England - 12 February 2002 - BBC Genome". genome.ch.bbc.co.uk. ^ "Crime and Punishment - BBC Two England - 13 February 2002 - BBC Genome". genome.ch.bbc.co.uk.